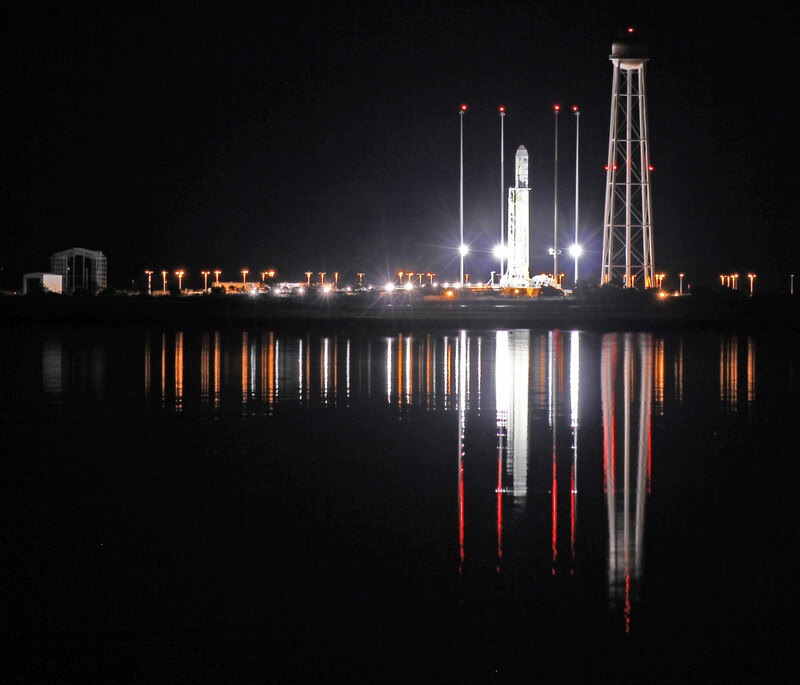 NASA WALLOPS FLIGHT FACILITY, VA – All was calm, the air was crisp with hope and the skies were clear as far as the eye could see as the clock ticked down to T minus zero for the Oct. 28, 2014 blastoff of an Orbital Sciences commercial Antares rocket from NASA’s Wallops Flight Facility, VA, – on a mission of critical importance, bound for the International Space Station (ISS) and stocked with science and life support supplies for the six humans living and working aboard. 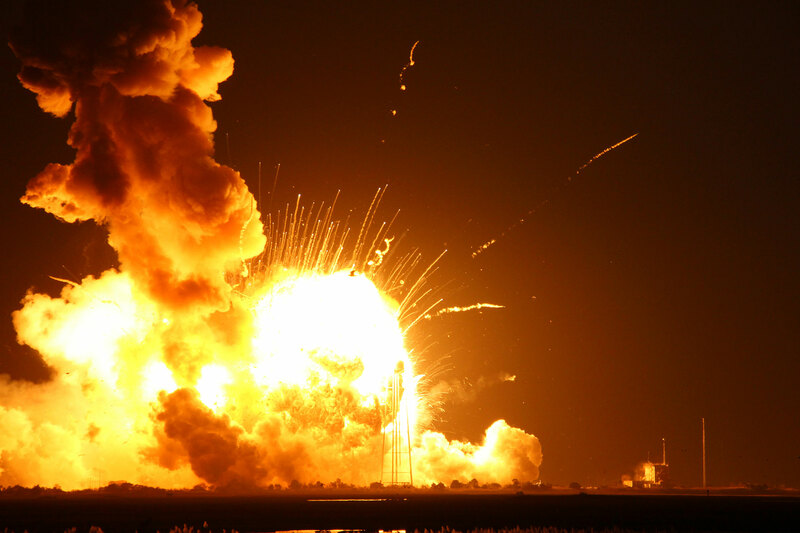 Tragically it was not to be – as I reported live from the NASA Wallops press site on that fateful October day. The 133 foot tall rocket’s base exploded violently and unexpectedly some 15 seconds after a beautiful evening liftoff, due to the failure of one of the refurbished AJ26 first stage “Americanized” Soviet-era engines built four decades earlier. I watched with anticipation, just 1.8 miles away from the launch pad, camera in hand with all the other press and spectators. It seems so far away. We all wish we could be closer, UNTIL we are rocked with multiple explosions and then we wish we were even further away. Myself and a small group of space journalists working together from Universe Today, AmericaSpace and Zero-G News had placed sound activated cameras directly at the launch pad to capture the most spectacular up-close views for what we all expected to be a “nominal” launch. 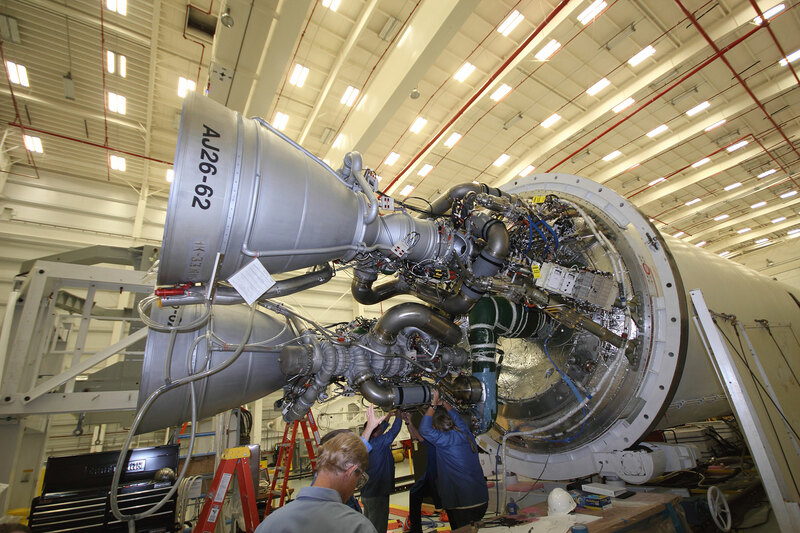 Antares first stage is powered by a pair of AJ26 engines originally manufactured some 40 years ago in the then Soviet Union and originally designated as the NK-33. Overall this was the 5th Antares launch using the AJ26 engines. 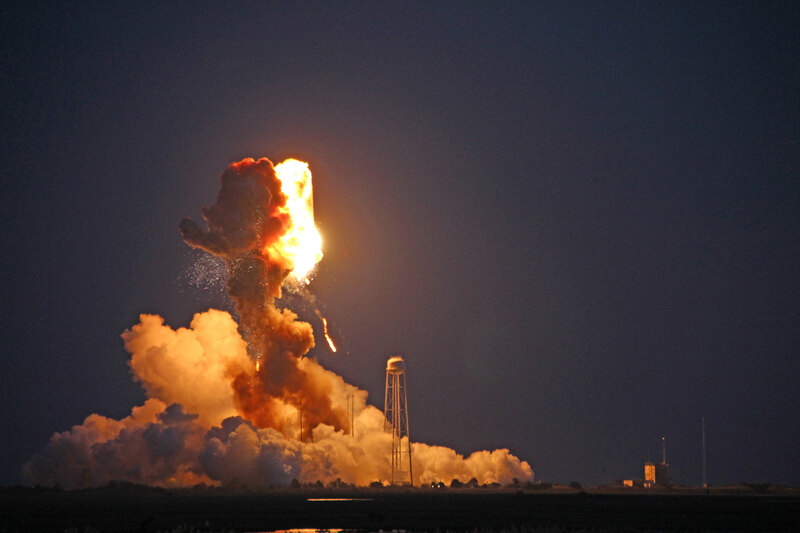 Moments after the highly anticipated and seemingly glorious liftoff, the private Antares rocket suffered a catastrophic failure and exploded into a spectacular aerial fireball over the launch pad on the doomed Antares/Cygnus/Orb-3 mission to the ISS. Our remote cameras were placed directly adjacent to the Antares pad OA at the Mid-Atlantic Regional Spaceport (MARS) and miraculously survived the rockets destruction as it plunged to the ground very near and just north of the seaside launch pad. impounded by Orbital’s official and independent Accident Investigation Board (AIB), that was assembled quickly in the aftermath of the disaster and charged with determining the root cause of the launch failure. The photos captured on our image cards were used as evidence and scrutinized by the investigators searching for clues as to the cause. 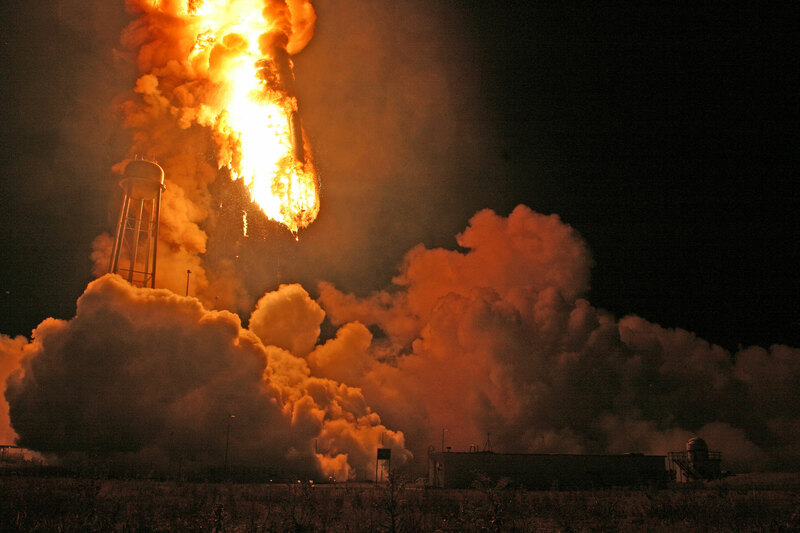 Similar NASA and Orbital Sciences photos have not been publically released. Over a month after the event, they finally released the recordings back to us allowing me to relive the events, second by second. My remote camera images herein shows Antares terrifying descent into a hellish inferno. And one clearly shows that the south side engine nozzle was intact after the explosion. Thus it was the north side engine that blew up. I was totally stunned trying to comprehend what was happening because it was all so wrong. It seemed simultaneously to last for hours and mere moments. I knew as a scientist and journalist that I was watching a mounting disaster unfold before my eyes. I prayed the rocket would emerge unscathed, but knew it wouldn’t – and it didn’t. A series of irregular, ear-piercing mid-air explosions suddenly rocked the area. And it went on and on. And now there was absolutely no doubt this was an utter catastrophe. Suddenly I felt a pressure wave followed by a noticeable heat wave passing by. At first I wasn’t sure it was real or my imagination. But talking to others, and looking later at my video I knew it was for real. The shaking video from my tripod mounted camera dramatically proved that. Then the rocket began to fall back to Earth. Then the ground blew up as the rocket pieces hit the ground and exploded into a hail of smithereens in every direction. I wasn’t scared – but definitely stunned beyond description. I wondered for a moment if some dangerous debris was hurtling towards us. But I realized by then it was too late anyway. By this time within moments our NASA escorts starting yelling to abandon everything in place and head immediately for the buses and evacuate the area. A ground fire was spreading, mostly to the northern portion of the pad and the expanding air borne plume also blew northwards. The ground fire was still burning over a half hour later we could see later on videos. It’s absolutely heartbreaking for everyone’s painstaking efforts to get to the point of liftoff after years of effort to fulfill the critical need to resupply that station with the science equipment and experiments for which it was built. I met many excellent folks from Orbital and NASA over the years who worked so hard and put all their hopes and dreams into this launch. It’s a total tragedy. Looking at my press site and remote photographs afterwards and seeing Antares descending frame by frame into a hellish inferno and being completely consumed is beyond blood curdling. It’s beyond absolutely chilling. Now I know what hell is like on Earth. Thank God no one was on board I keep thinking to this day, replaying the disaster in my mind. 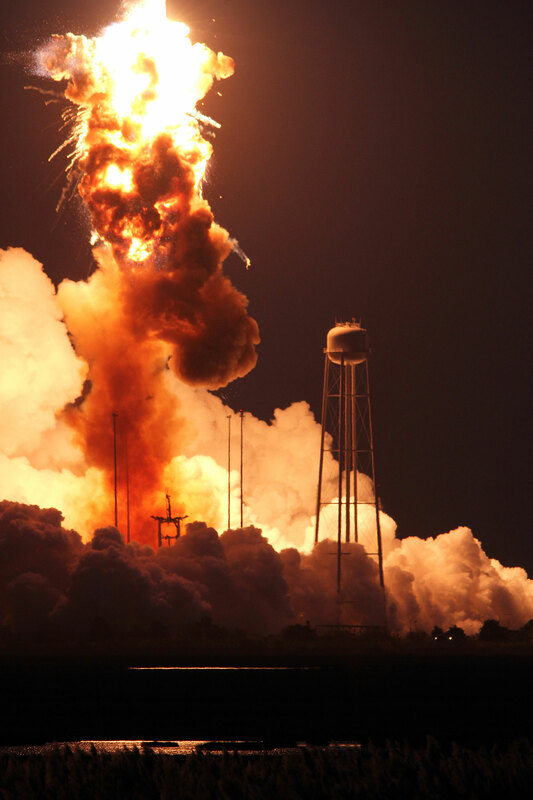 The Antares disaster will have many repercussions and some ways of doing business in space may well need to be radically altered. Orbital Sciences is under contract to deliver 20,000 kilo-grams of research experiments, crew provisions, spare parts and hardware for the eight ISS flights. Atlas V rocket built by United Launch Alliance to launch Orbital’s next Cygnus cargo ship to the orbital science lab. Orbital and ULA signed a contract to launch at least one and up to two Cygnus cargo missions to the International Space Station (ISS) under NASA’s Commercial Resupply Services (CRS) program. The first Cygnus mission would liftoff sometime late in the fourth quarter of 2015 aboard an Atlas V 401 vehicle from Space Launch Complex 41 (SLC-41) at Cape Canaveral Air Force Station in Florida. I hope to be there to witness it and look forward to reporting a more uplifting story next time.